It was 2006 when Tohoku University School of Medicine Assistant Professor Tatsuro Misu determined that two diseases with similar clinical symptoms were in fact entirely different things. This issue had been the subject of dispute for at least 100 years, and TJEM, under Editor-in-Chief Professor Shibahara, was recommended by Assistant Professor Misu's former teacher, Professor Yasuto Itoyama, for publication of the article that was very likely to settle the matter, says Misu. "At the time, to be honest, I didn't know much about TJEM. I remember at first discussing with my teacher that I wanted to submit to Nature or another influential overseas publication," recalls Misu. There were many rivals for this research, and being the first in the world to publish an article was an issue of the highest priority. "The first thing Dr. Itoyama thought of was TJEM. He reminded me that I could get beaten to the punch if I were too hung up on Nature , and that it was the content of the article that mattered. I was just focused on getting it out there as quickly as possible." It was the end of April when Assistant Professor Misu read TJEM's submission policies. At the general meeting of the Japanese Society of Neurology, held in Tokyo in May of the same year, he announced his research, without releasing the core photographs, and spent most of his time at the conference preparing his article. Then, late at night on Friday, May 12th, during the opening of the conference, he made an online submission of his work to TJEM. "Surprisingly, the next day, I got a reply from Dr. Shibahara, including referee comments, and that same afternoon, I returned to Sendai to revise the article and have it checked again. I then corrected other issues such as diagram formatting and English expressions that had been highlighted. I had a face-to-face meeting to have the article format and so on checked, and three days later, on the 15th, it was accepted. It's incredible when I look back, but I'm very grateful it was accepted." In a world where it normally takes months from submission to publication, TJEM brought Assistant Professor Misu's article to publication at astonishing speed. What makes this journal unique? 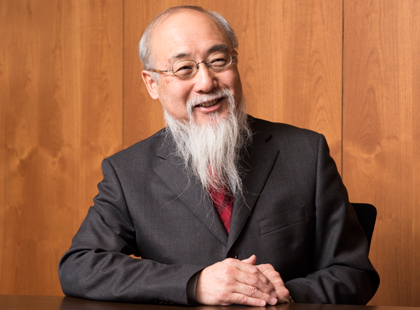 We asked Editor-in-Chief Shibahara, who makes an impression with his splendid beard he says he has been growing for almost 40 years, about how TJEM was founded. 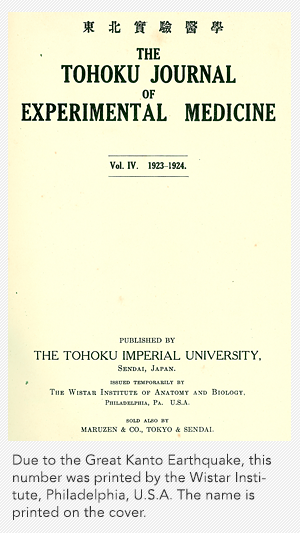 SHIBAHARA: Tohoku Imperial University was established in Sendai in June of 1907 as the third Imperial University, and Tohoku Imperial University College of Medicine was established 8 years later (its predecessor was established in 1872). 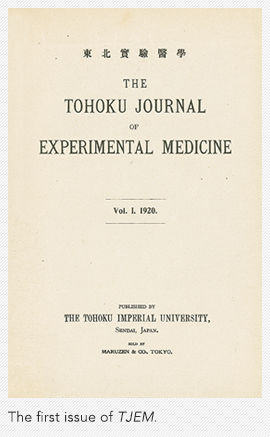 TJEM was founded in 1920 by three professors invited by the Medical College, and is the oldest periodically published English-language multidisciplinary medical journal in Japan. The original languages used were English, German, and French; Japanese was of course not used. Since 1956, the journal has been English-only. Those three professors were Toyoziro Kato (graduated Tokyo Imperial University, internal medicine), Yasutaro Satake (graduated Kyoto Imperial University, physiology), and Toshihiko Fujita (graduated Tokyo Imperial University, physiology). Professor Satake would later serve as Tohoku University President. SHIBAHARA: They set forth three editorial policies. The first was to widely seek out articles for submission both within the country and overseas, rather than just within the university. Next was the decision to sell through Maruzen, and to offer the journal to other universities and research institutions on an exchange basis, but not to donate it. The final policy was to work toward periodical and continuing publication. These pioneering editorial policies have served to support TJEM. In fact, TJEM is found in the collections of the libraries of major universities and research institutions all over the world. The journal has also published many historically important articles, hasn't it? SHIBAHARA: In the early 1920s, the man who made his name in history as the discoverer of insulin was a professor from the University of Toronto, but during the same period, Dr. Taizo Kumagai from Tohoku Imperial University had also reported the existence of a regulatory molecule (the future insulin). In 1954, an article by Dr. Ototaka Higashi from the Tohoku University pediatrics department paved the way to the establishment of a new conception of a disease, known as Chediak-Higashi Syndrome. It is one of a small number of diseases to which the Japanese Dr. Higashi' s name is attached (Tohoku J. Exp. Med. Vol.59 (1954), No.3 p.315-332). In addition to these, many other important articles have been published. Much has happened in more than 90 years since the founding of the journal. When the Tokyo printing office was damaged in 1923 during the Great Kanto Earthquake, the journal was printed by the Wistar Institute (Philadelphia) thanks to an introduction by Professor Shinkishi Hatai, who had left the University of Pennsylvania in the U.S. for Tohoku Imperial University College of Science. Publication continued even at the height of the Second World War, and even though publication was suspended the year following the end of the war, the editors, including Professor Koichi Motokawa, are said to have strapped on backpacks during the chaotic post-war period and scrambled to ensure a supply of paper stock. Professor Motokawa would also later serve as Tohoku University President. Since April of 1960, the journal has been published by Sasaki Printing & Publishing Co., Ltd. in Sendai. With this background, TJEM arrives at a turning point in the wake of the rapid economic expansion following the war. 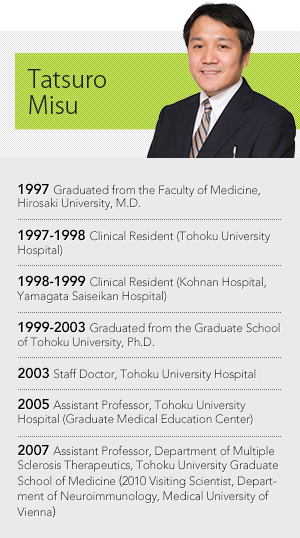 SHIBAHARA: Dr. Norio Taira, who became Editor-in-Chief in 1980, established Tohoku University Medical Press as a new publishing parent organization for TJEM, which had until that point been published as an organization connected to the university. It was established as an independent organization from Tohoku University School of Medicine, and top-class researchers from around the country were sought out to serve on the editorial board. Additionally, as a result of creating an independent organization, it also became possible to obtain outside funding, and the organization was able to obtain publishing assistance from the (former) Ministry of Education, Science and Culture. 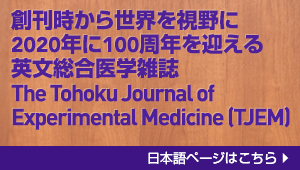 In the midst of greatly changing times, former Editor-in-Chief Dr. Hiroshi Satoh changed the format of the journal to use A4-size paper, and was instrumental in the internationalization of TJEM, recruiting overseas editorial board members and creating a home page, among other efforts. It is thanks to efforts by this succession of Editors-in-Chief that TJEM has been able to remain in publication. After I took over as Editor-in-Chief in 2003, I pursued further internationalization, and in 2004, thanks to support from the Japan Science and Technology Agency, we made the transition to open access (Japan Science and Technology Information Aggregator, Electronic (J-STAGE)), in other words, all articles being available to the public at no cost (https://www.jstage.jst.go.jp/browse/tjem).